Keywords: spectral rectangular collocation polynomial interpolation oscillatory solutions initial value problems boundary value problems ordinary differential equations. AMS Mathematics Subject Classification 2010: 65D05, 65D25, 65L05, 65L10. The genesis of the word spectral is not absolutely clear but presumably, arises from the genuine use of Fourier sines and cosines as basis functions 1 particularly in connection with scale between two extreme points, namely the spectrum. Spectral methods should not be confused with finite element methods (FEMs) based on the fact that they are closely related. The spectral methods use basis functions which are non-zero over the whole region, while the use of basis functions which are non-zero only on small sub-regions is particular to FEMs. Also, spectral methods are known to be global methods, and seek one solution for the entire region, rather than finite difference or finite element methods which seek a solution only in a local area to the element or node N.
Spectral collocation methods (SCMs) mainly use Chebyshev properties for its computations, reason why they are sometimes referred to as Chebyshev spectral collocation or pseudospectral methods. These SCMs have been firmly established in the numerical solution of differential equations (DEs) see 2, 3, 4 and other references therein. 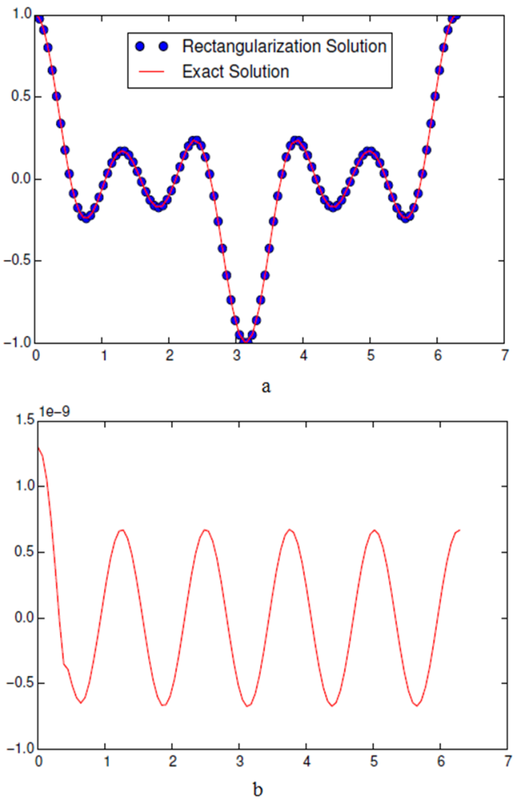 SCMs are based on the representation of a real, continuous, well-behaved function on some interval [a, b] using fast and stable algorithms such as barycentric interpolation formula in 5 and finite Fourier transform in 2. Compared with other formalizations of spectral methods such as the Galerkin approximations (see 6), they offer convenience in the presence of variable coefficients and non-linearities 7 which make these algorithms more accurate, for a given computational power. SCMs have become increasingly popular for solving DEs due to the fact that they enjoy rapid convergence. See for example the solution of unsteady boundary layer flows that are described by systems of coupled non-linear DEs in 8. The unknown solution of the DE is approximated by a global interpolant, such as polynomial of high degree. This global interpolant is then differentiated exactly, and the expansion coefficients are determined by requiring the equations to be satisfied at an appropriate number of collocation points 9. Since interpolation, differentiation, and evaluation are all linear operations, the process of obtaining approximations to the values of the derivative of a function at the collocation points can be expressed as a matrix-vector multiplication 9. 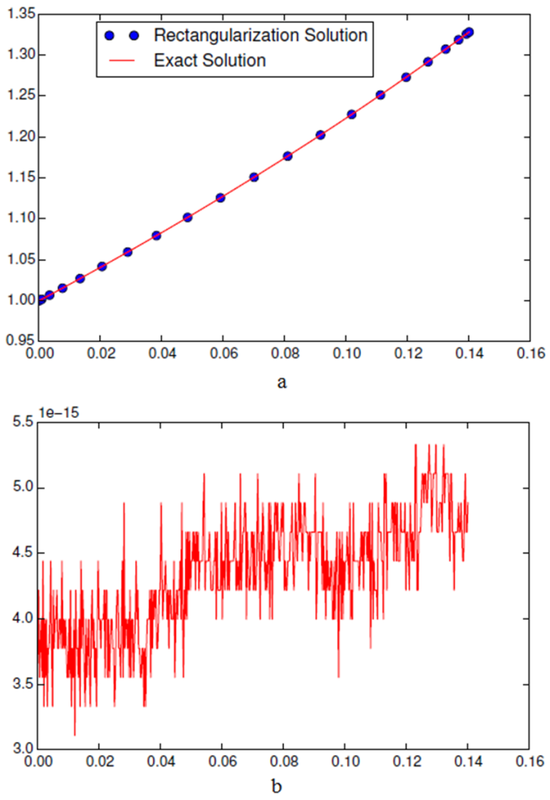 Spectral discretization of DEs have been of great use in computational mathematics, engineering and other branches of science. This idea become more interesting with the emergence of the traditional row replacement strategy see ( 3, 10, 11, 12, 13) but not quite efficient for solving DEs with boundary conditions other than -1 and 1. In this case, the choice of row to enforce the boundary conditions become ad hoc 7. 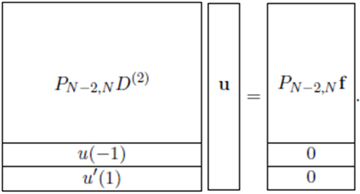 Due to this snag, 7 introduced an efficient means of rectangularizing the differentiation matrix to enable the enforcement of the boundary conditions. In this paper, we discretize the problem posed in the sense of the work in 7. However, the explicit form of the work in 7 can be found in 11. Interestingly, emerging computational approach for reformulating all kinds of DEs to systems of first order equations as been established in 14.
given two maps and Here, Otherwise one should use the barycentric formula of the first kind (5) instead. However, one attractive ingredient in the barycentric formula of the second kind (6) is that it generalizes to rational functions which has been a great tool for building Chebfun software package 25. The second order differential operator (14) is rectangularized by a re-sampling matrix (12) on the left hand side and similarly for f on the right hand side to give room for enforcement of the boundary conditions which makes the system a square matrix again. Hence, the system can be solved easily. to obtain the N for the discretization process of each problem in this section. We have successfully introduced this transformation for obtaining the node N in the course of the research as it can rarely be found in the literature. Consequently, this is to synergize the relationship between the step size and node during the implementation process. The implementation was carried out using numpy, numpy.linalg, pylab while plottings were obtained using matplotlib.pyplot, which are all packages on Python. 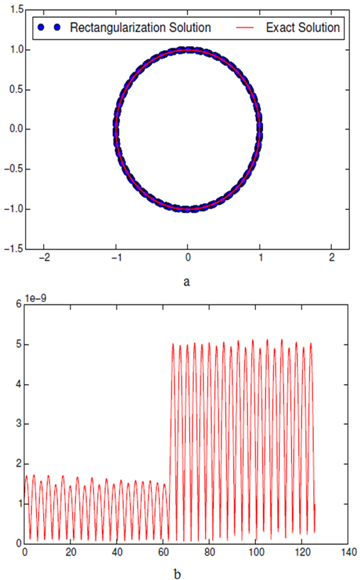 The theoretical solution is given by We analyze problem (17) using our rectangular discretization approach in the interval [0,40] which corresponds to 20 orbits of the point at . We multiply the re-sampling matrix by (24). Hence, we can solve the system (34). 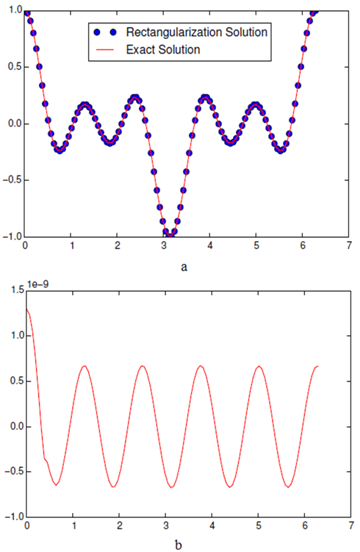 We have properly formulated and implemented our spectral method based on the state-of-the-art rectangularization approach for the solution of oscillatory IVPs and non-linear BVP in DEs. This approach requires the discretization of polynomials, forcing DEs into polynomial through the introduction of the re-sampling matrix which re-samples the differentiated polynomials into a lower-degree subspace. The solutions of the DEs are then represented as finite vectors of their values at certain points. Each such vector implicitly defines a global interpolant, and operations on the DEs are replaced by the same operations applied to the corresponding interpolants. Emphasis are now being placed on spectral methods when approximating for which we have introduced the concept of transforming the N into H using the relation (15) before discretizing the IVPs and BVP through rectangularization. In doing this, we observe spectral convergence unlike other conventional approaches. Our results of striking accuracy with efficient use of computer resources outperform the existing results (see Table 1, Table 2, Table 3). 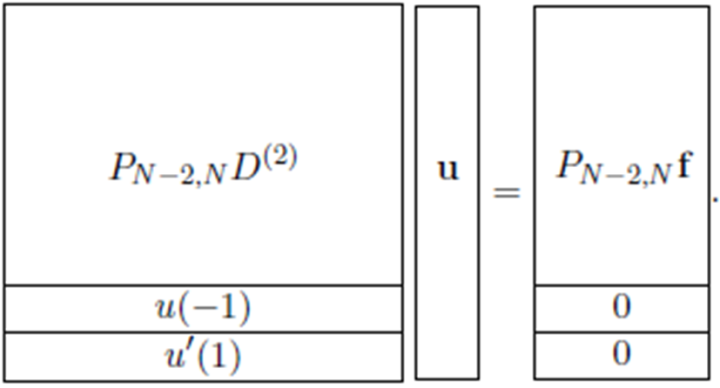 In particular, result as in Figure 3, Figure 4, Figure 5 shows the spectral accuracy and efficiency of the new rectangularization approach. It is our hope that the algorithm of emerging numerical codes for the discretization of DEs will be dominated by the used of the rectangularization approach just as it has already started in 7. The authors are thankful to Professor Neil Turok for his Next Einstein Initiative in Africa which has led to the establishment of the African Institute for Mathematical Sciences, Kigali City, Rwanda where the research work was carried out. Special thanks to instructor Mr. Edward Korveh for his guidance in the course of this research work. Ibrahim, Oluwasegun M., and Piers W. Lawrence. "Spectral Rectangular Collocation Formula: An Approach for Solving Oscillatory Initial Value Problems and/or Boundary Value Problems in Ordinary Differential Equations." Turkish Journal of Analysis and Number Theory 7.1 (2019): 11-17. Ibrahim, O. M. , & Lawrence, P. W. (2019). Spectral Rectangular Collocation Formula: An Approach for Solving Oscillatory Initial Value Problems and/or Boundary Value Problems in Ordinary Differential Equations. Turkish Journal of Analysis and Number Theory, 7(1), 11-17. Ibrahim, Oluwasegun M., and Piers W. Lawrence. "Spectral Rectangular Collocation Formula: An Approach for Solving Oscillatory Initial Value Problems and/or Boundary Value Problems in Ordinary Differential Equations." Turkish Journal of Analysis and Number Theory 7, no. 1 (2019): 11-17.